My friend Jill from over at Yeah. Good Times. is now into cross stitch, and she made me this. 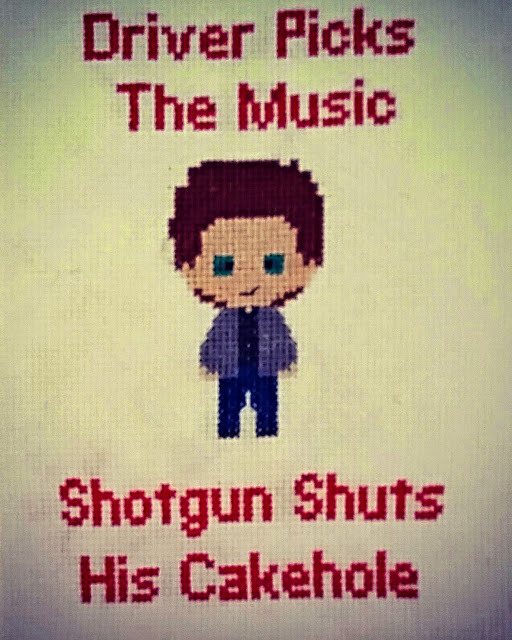 It's Dean Winchester, from the TV show Supernatural. This is one of my favorite quotes from the show, and Jill was kind enough to make this for me. I know that the line here is supposed to be funny, but today it struck me as something more profound. Like many people, I have a need to control as many aspects of my life as possible. As a career woman, I have deadlines and schedules to keep. As a mom, I have grocery lists, school supplies, lunch items, soccer gear, medications, laundry, and many other items. Some sort of control, usually a organized one, is in order. A calendar is essential in my life, for example, so I can keep track of what is coming up and prepare for it. I make lists of things I have to do; I write these on sticky notes and attach them to my calendar. I keep a planning calendar, which I scribble all over, and an electronic calendar that is on my phone. I often tell people that if it's not written down, as far as my brain is concerned, it didn't happen. Sometimes I wish that I'd never written down that first doctor's appointment. Would this tumor have gone away if I hadn't made the appointment? My sense of control keeps me calm, and less likely to completely melt down. I've been through other trials over the years, and feeling as though I had control over some aspect of the situation helped me stay sane. But cancer isn't about control. Not really. Oh, there's appointments that you write on your calendar, lab tests, chemo, and all that. But that's just window dressing, an illusion of control. I have this thing growing in my breast, and maybe it's gone in a year, maybe it's not. But the fact remains that despite all I will try to do, I may still have cancer in a year. And that freaks me completely out, the idea that I have no control. It makes me want to hide under the covers and just cry until my eyeballs pop right out of my head. It's something that I fight every single day. I argue with myself. I deny. I bargain. Anything. I want to be in control. I'm not. And then I find exactly what I need to hear from a character on a tv show. As if someone could see my inner turmoil. The Driver, or the deity of your choice, is in charge of the ride. He(or she) directs the car into traffic, makes the turns, and gets us to our destination, where ever that may be. He gets to pick the music for our road trip and we are stuck with it for the duration. We can either spend our time arguing with our deity about his(or her) choice of music while trying to grab the wheel, or we can sit back, let go of the wheel, and just listen. I'm going to try to 'shut my cakehole'. I'll do my best to let go of what I can't control. I'm not giving up. I am going to see where this car ride takes me. Maybe I'll learn something along the way. Truly wishing you luck with the attempt...riding shotgun is such a b*tch!! !